NOLA’s Federal City neighborhood is undergoing a renaissance. It consists of a public-private mixed-use development located on 156 acres of the former Naval Support Activity New Orleans on the West Bank. The base closed in 2011, and since then the facility has slowly been transforming into a high-end residential community along the waterfront. Recently, however, the massive redevelopment effort has accelerated and includes both residential and limited commercial spaces. The residential development includes apartments, condos and single-family homes, and there are also plans for grocery stores and other small businesses to support the neighborhood. The area is being branded as the New Orleans Riverside at Historic Algiers. 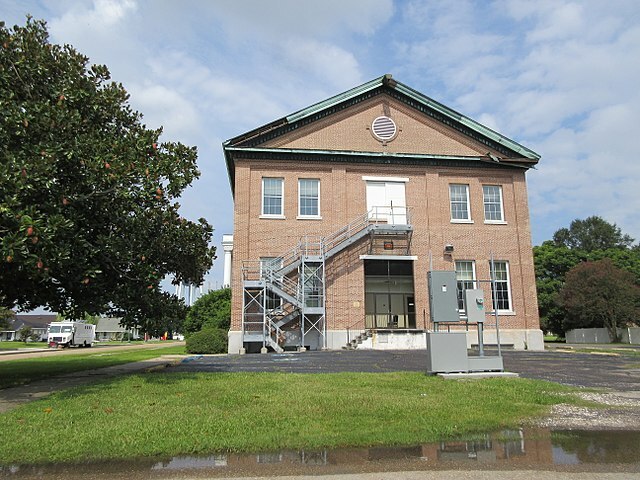 Federal City is located on the Mississippi River next to Algiers, and its boundaries consist of Hendee Street, the river, General Collins Avenue, Newton Street and General Meyer Avenue. The land was originally part of a huge West Bank concession given to New Orleans’ founder Jean-Baptiste Le Moyne, Sieur de Bienville, in 1719. It was later purchased by the US government in 1849. In 1901, the US Naval Station was formally established. The Naval Station underwent several long periods of inactivity, and in 1962 was designated as the Headquarters, Naval Support Activity. At its height, the complex employed over 4,6000 people with a $142 million annual payroll. The base closed in 2011, and the city has hired and fired several developers who failed to deliver on the area’s redevelopment plans. Today, the Algiers Development District, the City of New Orleans, and state and local officials are collaborating to fulfill the promise of Federal City’s rebirth, and the project is one of the largest economic development initiatives for the state of Louisiana. The mission is to, not only create housing, but economic opportunities while simultaneously serving the retail, entertainment and recreational needs of West Bank and Greater New Orleans residents. The effort has already resulted in a number of vital neighborhood amenities, including several businesses, a fitness center, pool, retail center, hotel, auditorium, college, churches, schools and a walking/bike path that spans from Algiers Point Ferry Terminal to the former Todd Shipyard. As the redevelopment effort progresses, expect to see more grocery and convenience stores, restaurants and retail spaces, parks and public spaces, as well as the implementation of Phase II of the walking/bike path, which will culminate in 5.6 miles of well-lit, riverfront trails stretching all the way to the Chalmette Ferry Landing. The up-and-coming Federal City neighborhood is sure to grow quickly as it adds residences, shops and office buildings. For a vibrant and dynamic area with an idyllic setting, deep history and strong community ties, Federal City is not to be missed. Check out the rest of my neighborhood series to learn about other great areas in New Orleans.